You remember the Golden Rule, right? “Do unto others as you would have them do unto you.” It was drilled into our heads as children now many of us recite it to our own kids. It’s a simple lesson about being kind and fair toward others. But, I’ve realized something about the Golden Rule: It’s not always right. In the business world, it actually misses the mark entirely. 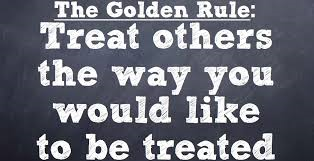 It shouldn’t be: “Treat others as you wish to be treated,” but rather: “Treat others as they wish to be treated.” What the Golden Rule lacks is empathy. And Empathy is key because it takes YOU out of the equation. When it comes to creating a customer-centric model for your company, empathy is everything. Empathy in marketing is not a new concept . Marketing relies on engaging a customer’s emotions, but to do that effectively, we first need to be able to identify and understand those emotions. Data can indicate pain points, research can reveal behavior trends, but only empathy can help you understand how a customer feels about their situation. When you really know where the customer is coming from—their past experiences, their current goals and challenges and how they feel about them—you can engage them with the right messaging at the right time. Every time. What is the customer experiencing right now? How does the customer feel about this experience? How do I want to impact that feeling? What can I do or say to make that impact? Notice that the goal here is to affect the customer’s emotion, not to solve their problem or, worse, introduce our own objectives. Treat them as they wish to be treated. The customer journey is no longer a linear path; it’s a landscape with circuitous routes both on- and off-line. It involves communication and touch points with Sales, Marketing, Customer Support and possibly other business functions. Every interaction your customer has with your organization influences their perception of it. If your role involves interaction with the customer, directly or indirectly, empathy just became mission critical for you. And when we do this well, the reward for this effort is simple: loyal customers. It costs less to keep an existing customer happy than to attract a new one, and organic recommendations from happy customers are still the most powerful marketing a company can leverage. How do we inspire loyalty? By fostering a customer-centric philosophy the entire organization embraces. What does a customer-centric organization look like? It acts on insight from empathetic engagement. It shares, relates and is easy to work with. It align business goals with customer needs. It checks in to make sure you’re moving forward together. When you put your customers at the heart of everything you do, you win their hearts in return. Perhaps we can revise the Golden Rule for business: Do unto customers as they would have done unto them, and they will do the same for you.